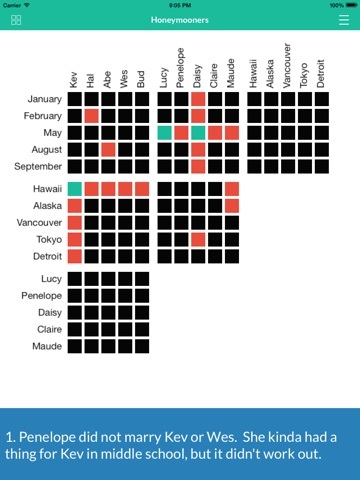 Long before Sudoku hit the scene there were Logic Grid Puzzles. Developed by Lewis Carroll (besides writing Alice In Wonderland, he was also a mathematician and logician), these logic puzzles rely on deducing a complex solution from only a few pieces of information! You're probably thinking, "Whoa, that sounds really nerdy!" And you're right. But it's also really addicting. With only a few clues, you'll be able to fill in the entire 6 grid puzzle after you put your brain to work. Plus, these types of word problems and logic puzzles are showing up with increasing regularity on standardized academic tests like the SAT, LSAT, MCAT and GRE. So beyond just being a fun past time, they're also a great way to prepare yourself for higher level learning. 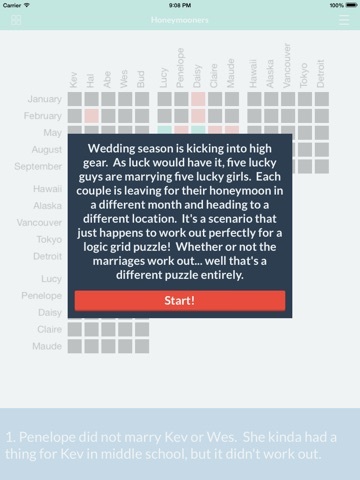 The app is free, and includes a starter pack of puzzles so you can see if Logic Grid Puzzles are your kind of fun. If they are - there are already more packs with many more puzzles in place you can purchase from within the app - and I'm hard at work writing more puzzles to add in as soon as possible. Sudoku and Ken Ken puzzles are fun, but I think you'll agree that solving word problems pushes your brain in ways those math based puzzles don't!